Have you always been a back row forward? I am not sure how many points I scored either but not very many! Pat Parfrey was the main coach whilst I was at London Irish and he was outstanding. Richard Rea was the first captain when I as there and then Walt Jones, who was a great partner in the back row for many seasons, Ken Kennedy and Duncan Leopold. Training was always enthusiastic - It became more serious as the seasons went by. Sunbury had a wonderful atmosphere: on the field for the playing and off the field for serious socialising. It was also a good place for families and the balance of the three was just about perfect. I always liked playing at the Rosslyn Park ground and Old Deer Park. There were so many incredible characters at London Irish of such different types that it would be wrong to pick them out. 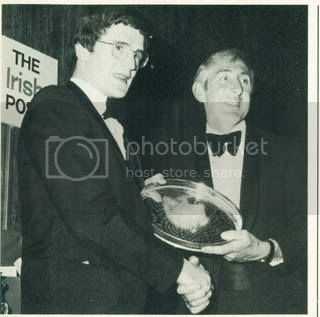 Two who are unfortunately no longer with us were David Donovan and Michael O’Connor, who did so much for the club as president. I do keep in touch with old team mates but do not see as many of them as often as I would like to. We had a memorable reunion the night before London Irish played Northampton in the cup a few years ago. You played in the 1980 Cup Final, what are your memories of that day? Reaching the 1980 final was a major achievement for us. In the final Leicester were just too good for us on the day but the London Irish team played with huge commitment and passion as was demonstrated by the fact that we scored the only try of the game. Professional rugby is different and it wouldn’t be practical for London Irish to compete in the premiership nowadays whilst restricting themselves entirely to only Irish players. I do miss playing for London Irish. It was a unique time with unique individuals and enormous fun. The exile nature of the club made it the focus for serious sport but also for the enjoyment of the players spending a period of their lives in London. I toured South Africa with London Irish which was a tough but enjoyable tour playing some very good sides. Did you ever play Inter-provincial rugby one day and for LI the next? I can’t remember playing provincial rugby one day and for London Irish the next but did play a few games for the club the day after playing internationals which was probably unwise. My most memorable game was probably the cup semi-final against Rosslyn Park. I will always remember Clive Meanwell’s match winning touchline kick in that match after Andy Ripley had passed me as we changed ends at half time saying to me that it was all over because they now had the wind. 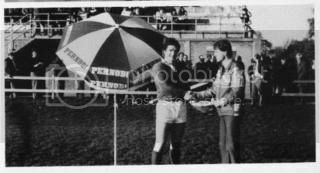 Equally memorable, however, was the match in which our infamous touch judge of those days attacked one of the other side’s players (who had previously played for us) with his touch flag! You played a number of games for Ireland, how did it feel to put on the jersey for the first time? The first time I pulled on the jersey for Ireland was fulfilling a lifetime’s ambition. What are your memories of playing for Ireland? It was a great time to play with Ireland as we had a stable team full of good players who got on with each other. How different was the training with Ireland compared to London Irish? Training was obviously more intense and concentrated with Ireland but one similarity was that I was lucky to have coaches in Noel Murphy, Tommy Kiernan and Parfrey who had great insight into the game and the players. Who do you consider was the best player you played with for Ireland? 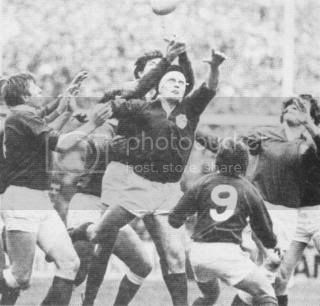 I was particularly fortunate to play with Ollie Campbell at flyhalf and with Willie Duggan and Fergus Slattery in the back row. Did you go on any overseas tours with Ireland? If so where? I toured Australia and South Africa with Ireland. Both tours were great fun although we were more successful in Australia winning both tests whilst losing both in South Africa. Twickenham because of the atmosphere with tremendous Irish support there. Will you miss the current Lansdowne Road when it’s demolished? I will miss the current Lansdowne Rd but I’m glad the new stadium will be built on the same site. 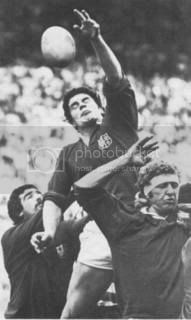 You toured with the Lions in 1980 to South Africa, what are your memories of the tour? The Lions in South Africa in 1980 was another tour which was exhilarating and wonderful fun. We had a good management team in Sid Millar, Noel Murphy and Billy Beaumont and the whole party gelled very well. We were unlucky to win only one test. I played in 4 tests and 8 provincial games. Who was your room mate? I regularly roomed with Maurice Colclough, a great character who unfortunately died last year, and Ray Gravelle who was equally irrepressible. How difficult was fitting 18 matches into 10 weeks? I didn’t feel it was too difficult fitting 18 games into 10 weeks as in those amateur days it was wonderful to have time to be able to train, play and occasionally socialise without having to try to fit it in around work. You also toured with the 1983 Lions to New Zealand, what are your memories of the tour? I am the president of the Irish Exiles. Our main role is to try to identify young Irish qualified players over here of potential. Did you play for any other clubs? I played a season for Manchester and two for Liverpool St Helens but missed London Irish and for a while travelled down from Manchester to Sunbury. You played Inter-provincial rugby for Connacht how different was playing Provincial rugby compared to London Irish? Playing rugby with Connacht was very enjoyable even though we went several years before winning an interprovincial match. Despite this there was always huge commitment from the team and coaches such as Tony Browne without any of the internal strife off the field which a loosing streak might cause. Did you play County rugby if so who for? I played one season with Lancashire and one with Surrey. How enjoyable was playing Barbarian Rugby (especially the Hong Kong 7’s)? 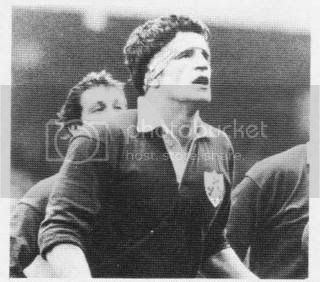 Playing in the Hong Kong sevens for the Barbarians and later for the Wolfhounds were great experiences but little deserved with my complete lack of 7s pedigree as anybody at London Irish from the time will tell you! 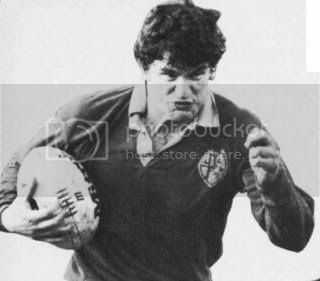 Mick Molloy at London Irish and with Ireland had a very major influence on my rugby career. I rather foolishly played until about three years ago. Richie McCaw must be a good flanker to play in the back row with. I have about equal regard for the different way rugby is played now and in my time. I feel there was a bad patch a few years ago when the scrum was depowered and the super twelve’s were being refereed like basketball but that now there is again a good contest in all phases. This means there is room for all shapes and sizes of player which is an important difference from rugby league. I personally wouldn’t have liked being lifted in the lineout as it would have given me vertigo! Can you give a brief resume of your non-rugby career? Last edited by PaulHP on Fri Mar 07, 2008 9:24 pm, edited 2 times in total. Thanks, Paul - another good 'un...! Odd isn't it? A lot of players of the amateur era played a game with the intention of bashing and bruising and breaking other people. Then on Monday they went to work and put them back together again.